Train ticket art – yes, it’s still going! I’m still creating art out of my box of old train tickets. I got a gelli plate for Christmas (more on that in a subsequent post) so I’ve been using it to create backgrounds on the tickets – the gesso with which I prepared them picks up the acrylic paint really well. Here is a mosaic of some of the tickets – the exhibition at the Riverfront arts centre in Newport is approaching. The chairman of our group emailed us to ask for images of artwork for the centre to use on their website and I’m thrilled to say that they used one of mine. It will be on from 8th to 24th April this year. split pins through holes – I’ve got some pretty decorative ones (eg with dragonflies on the ends) and this was tempting but the tickets had to be overlapped too much. This is now I’m attaching them together but hopefully with a less conspicuous colour thread! Here are some more tickets, one or two mostly finished, some with just a background layer so far. I’ll have to stop creating them soon and stitch them together – I’m giving myself all of March to do that. I want to try and arrange them in groups of some sort, not just randomly, but time will tell how successful that is. A recent selection of painted and printed train ticket art. If you’re in the South Wales area in April, do drop into our exhibition. I will keep you informed of progress! 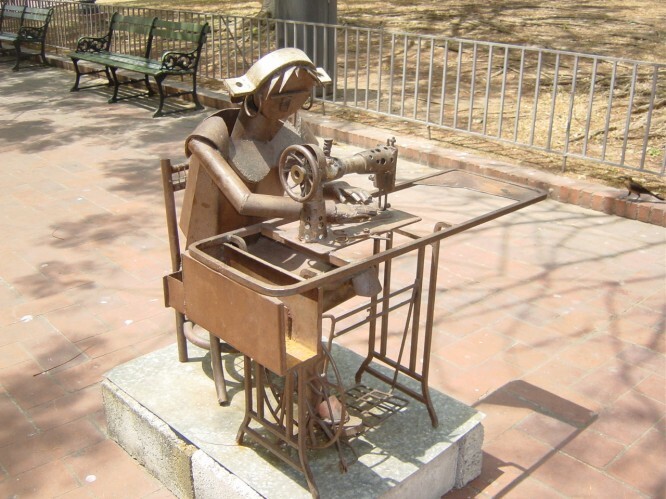 Whilst trawling through my Textile Museums favourites, I found this picture of a lady using a sewing machine. It is a metal sculpture. I’ve no idea why I bookmarked it under Textile Museums but I’m glad I found it again! I thought I’d put a picture of the only thing I’ve sewn in the last few weeks (apart from turning up the hems on umpteen pairs of trousers and mending DS2’s coat). It is another sample for the ladies of the sewing studio in Zambia for Health Help International. Ron is there now and took it with him. It is one of those wall tidies which you can hang on the wall and use to store small items in pockets. I have been busy this week, tidying and organising my studio yet again (well, I prefer to think of it as continuing the tidying rather than reorganising everything Yet Again….). Instead of organising my cotton fabrics by colour, I decided to do it by value. Reading Lisa Call’s blog inspired me. I ironed them all and folded them into approximately the same size. Sorting them was relatively easy after that. Looking at them, I have come to the conclusion that I have far too many in medium values and not enough at either end. After that I was energised (inspired, no doubt, by all the fabrics I had forgotten I had!) into sorting all the other sorts of fabrics, which previously I had organised by colour, into each type of fabric… the rusted fabrics have a container to themselves. I enjoyed stroking the silks and rediscovering the shiny fabrics, the velvets, the scrims, the sheers…. now I just need to use them in something and not just return them to the shelves…. So let me titivate your senses with photos of the silk sari fabric which DH brought me back from India. I love the gold edging on these.. This one is very fine, almost chiffony. I’ve been looking at websites of how to wear sari fabric now… I think it’ll be a while before I dare to cut any of this lot up! !